Recently Barrons asked the question: “Do you believe in technicals or fundamentals?” The article pointed out that while the technical picture looks bullish, the fundamentals remain weak and caution is warranted. I agree that the technical picture looks quite positive as the bulls seem to have regained their footing. On the other hand, respected investors and analysts such as John Hussman to David Rosenberg have been warning about the deteriorating economic backdrop. The price of economically sensitive Dr. Copper tells the story of improving technical picture. As the accompanying chart shows, trend following models experienced a “dark cross” (circled), which point to a downtrend when the shorter 50-day moving average crossed below the longer 200-day moving average. However, copper prices have rallied significantly since that event, which points to further short-term price improvement. In the end, it depends on one’s time horizon and risk tolerance. My inner investor remains extremely cautious and looks for market strength to lighten up positions. My inner trader, on the other hand, tells me to go with the flow and stay on the bullish momentum train. A couple of weeks ago I wrote that war might be the surprise way for the US to dig itself out of a debt hole. After all, investors tend to care less about mundane things like debt service ratios when the shooting starts – and who knows what kinds of assets the winner may gain in a war? [L]ast month the U.S., British and French navies held an unprecedented joint exercise in the Mediterranean, and right after, the U.S. aircraft carrier Truman and its 10 accompanying battleships crossed the Suez Canal to join the two other U.S. carrier groups already in the Gulf. Even more interesting, two weeks later an air caravan of American and Israeli cargo planes landed in Azerbaijan, downloading "equipment," which caused the Iranians to protest loudly and go on war alert. Such force concentration near the oil fields doesn't mean a conflagration is imminent, but it does mean the risk of one has gone up, with possible investment implications. Michael Hayden, former director of the CIA, believes that the march to war with Iran is “inexorable”. Consider these two interpretations on his interview with CNN’s State of the Union. The first is from the viewpoint of the hawks from DEBKA and the second from the doves at the Fabius Maximus blog. For investors, war would be the ultimate reflation trade that would make the bears really run for the hills. This is a possible fat-tailed event that we need to keep an eye on. While coverage is not easily found in the mainstream press, it is possible to find sources such as DEBKA, which is good source of information (or disinformation, depending on how you view things). Readers should be warned that DEBKA has a Likud Israel-is-under-continual-siege mentality and is prone to exaggeration as it has falsely pounded the war drums before. For example, this recent story about the deployment of a third US carrier opposite Iran sounds alarming. Upon closer examination, the third carrier turns out to be the USS Nassau, which is an amphibious assault ship carrying marines rather than a large Nimitz class carrier such as the USS Dwight D. Eisenhower or USS Harry S. Truman, which are reportedly deployed in the theatre. Please be reminded that the United States has heavy troop presence in Iraq and Afghanistan and it would not be overly unusual to have one or two large Nimitz class carriers in the region. Investors should be prepared for the possibility of war, but analyze the situation carefully before jumping to conclusions. So you think you can be a portfolio manager? The task of managing portfolios isn't as easy as it seems. Not only do you have to think about issue selection, you also need skills like portfolio construction and trading. Over the years, I have seen very smart and experienced sell-side analysts who have had great difficulty making the transition to the buy-side and portfolio management. But when the market was hot, and deals would close within an hour, I would work differently. When the deal would come, I would put in for bonds, so that I would get some allocation. I would ask for the high end of what I would normally ask for, knowing that I would get scaled back considerably. Then I would send the details to my credit analyst, telling them that if they did not like the company, I would sell the bonds. Eventually, most of my analysts during the times when the market was hot would come to me and say, “How can you put in for bonds without an opinion from us?” First I would reassure them, and tell them that I valued their opinions, and that I would not hold onto a bond permanently unless they liked it. I would sell all bonds they did not like, but when the technicals favored it, within a few months. But I started selling away, and began to learn the art of price discovery. When you want to sell a bond, you first have to look at what investment banks ran the books of the deal. There is an unwritten rule that if they play that large role in origination, they have to make a market in the bonds thereafter. I also wrote a series called What do you do after you've made your picks that looks at the problems from the viewpoint of an equity manager (see Part 1, part 2 and part 3). Go and read them and you'll get some perspective. I would like to address the issues raised by my last post about buy-and-hold vs. dynamic asset allocation about the diversifying properties of other asset classes, specifically commodities. AllAboutAlpha recently wrote about the death of commodities as an asset class. One of the studies cited was from RS Investments, where they show commodity prices are increasingly correlated to equity returns. AllAboutAlpha concluded that commodities remain a good source of diversification since they are highly correlated to inflation. Izabella Kaminska at FT Alphaville addressed the commodity diversification issue slightly differently by observing that commodities are increasingly correlated to stock market returns because of the stampede of institutional funds going into the asset class. She went on to discuss the lengths that some dealers and institutions have gone to in order to minimize the loss of returns from rolling the contango. The rising correlation to equities and correlation to inflation both point to the same thing. The commodity trade has become just a risk trade. When I view commodity prices through the inflation-deflation macroeconomic lens in the Inflation-Deflation Timer model and put it on the risk-safety axis, commodities have become the risk, or inflation/reflation trade. The other end of the deflation, or safety axis is occupied by the US Treasury long bond. By the way, equities are correlated with commodity prices because they, too, represent the risk trade, or reflation trade, albeit in a less volatile fashion. Are commodities a good diversification building block? I am afraid not. They are just an extension of the reflation or risk trade represented by equities. MarketWatch published an article last week discussing the rise of trend based market timing strategies, compared to the more traditional buy-and-hold approach to investing. I also covered the same issue when I posted that we may have to wait eight years for a new equity bull to begin. To recap, we may very well be in a secular bear market, where returns are roughly flat as illustrated by the chart of the DJIA below. Zero return with portfolio volatility? Let’s do a back of the envelope calculation. The stock market’s dividend yield is around 2% and the 10-year Treasuries yield around 3%. Assume that stocks have no capital appreciation over the next 5-10 years, the expectation of return of a buy-and-hold balanced fund is going to be around 2.5%, regardless how you play around with the asset mix decision. Don't forget layer on the transaction costs and fees. After factoring in trading costs, which can easily be 1% or more for individuals, and investment management fees (conservatively estimated at 1-2% for an active solution, under 1% for passive solutions), the investor is left with little or nothing to show for his efforts, except for the volatility in his portfolio. Why not just sock the money into a savings account? To cope with a low return environment, the first-order solution for the buy-and-hold crowd has been to seek out yield. But there is no free lunch here either. Higher yield comes at the price of credit risk and credit risk could blow up in our faces in the current fragile economic environment. Some investment managers have sought to mitigate that with the concept of yield at a reasonable safety margin, which is not a bad solution under the circumstances and the constraints of a fixed asset allocation. My solution, along with some others cited in the MarketWatch article, is to trade the swings. The swings can be considerable – witness the trough-to-peak behavior of stocks since the March 2009 bottom. I am not alone in my choice of modeling platform. My Inflation-Deflation Timer model is based on trend following principles, as applied to various commodity prices. The MarketWatch article cites others who use similar techniques. Mebane Faber uses similar kinds of principles to limit losses in asset allocation. Coping with a low return environment is hard. Preserving financial staying power is of paramount importance under these circumstances. For those who believe in the static buy-and-hold asset allocation approach to investing, reaching for yield as a source of stability can be a reasonable approach if credit analysis is done properly. I happen to be in the dynamic asset allocation camp, where I believe the returns can be considerably higher given the likely volatility of the financial markets. The news flash came across my desk: China's leading credit agency downgrades the US, Britain and France from AAA. This news is undoubtedly a sign of things to come. The question is, can America retain its status as a leading economic power? The US is squandering its lead on both fronts. Instead of investing on productive physical capital, we have seen excessive malinvestment leading to bubbles in technology, real estate and finance over the past couple of decades. The internet and real estate bubbles were plain to see. As for finance, what does all of the malinvestment of human talent into Wall Street say to the world? Despite the ineffectual efforts at financial regulation, American remain in denial about the role of finance in society. The news of the Alan Greenspan chair at NYU is just another sign of denial. In addition, there seems to be signs of trouble in higher education, which is a key driver of the productiveness of human capital. Firstly, the lead in education isn't what it used to be. A recent study concluded that elite universities are eroding their competitive edge. I had blogged about a Tiananmen Square protester returning to China for the sake of his children because of the lower quality the Canadian education system, which from first hand-experience equivalent or slightly higher quality than the American system. 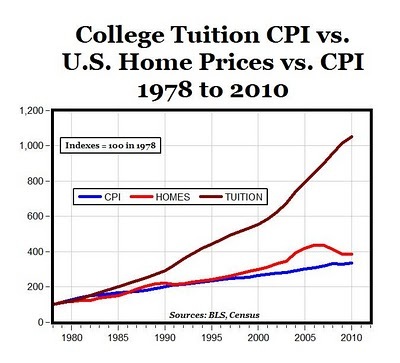 The market for college education looks a lot like the market for houses circa 2006 – very bubbly. And the reason is similar: There is too much credit. Colleges can keep raising prices, despite the recession, because the government keeps lending students more money to pay them. Malinvestment in physical capital and failing human capital...there will a time to pay the piper and that day may be coming sooner than anyone expects. Since the G20 meeting there has been a lot of hand wringing over the level of sovereign debt. Calculated Risk posted alarmingly about the frequency of sovereign debt in the past. Defaults tend to come in clusters, and the behavior of lenders often changes substantially after defaults. In the Volatility Machine, Michael Pettis asserts that sovereign default contagion follows predictable patterns, and that contagion is primarily due to investors in the first defaulting country also having investments in other countries which are vulnerable. This is especially the case with leveraged investors. So far, investors have firewalled many of these debt default concerns in the US. In fact, every time something blows up somewhere, Treasuries have rallied. Can this state of affair continue indefinitely? 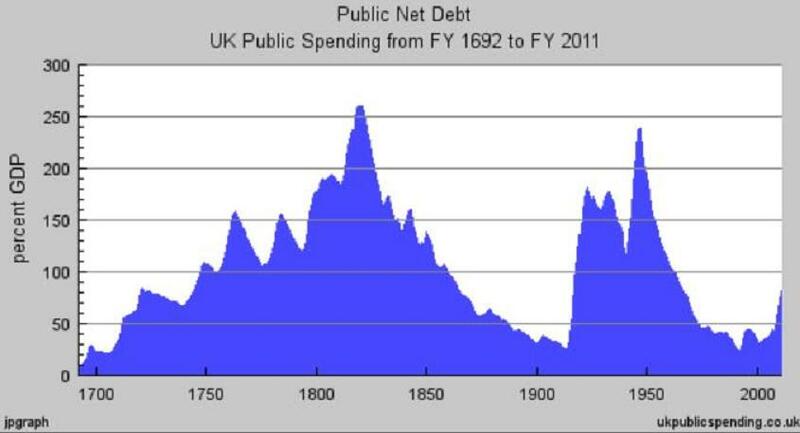 The first peak in debt to GDP occurred just after the Battle of Waterloo in 1815 and the second just after the end of World War II in 1945. Some market observers have pointed out that the US debt to GDP ratio has been higher than they are today. It is also instructive to go back to an earlier era to learn about how Britain dug itself out of her debt hole after the Napoleonic Wars. The answer is India. It began with the British East India Company rule of India and progressed to the British Raj. Simply put, the British went to India and took things as part of their colonial adventures. Could the US go down the same path? Tim Knight at the Slope of Hope posted that financial crises and crashes have led to wars. While the causation and historical links between financial stress and war look a little tenuous, there is a kernel of truth to the story. War is a possibility, but not a highly probable one. Avner Mandelman has written about this very issue (see Watch out if a cash-poor U.S. seeks new spoils and Austerity in the West? Not if the generals can be useful). During the 1990s, I said privately that the solution to Japan’s Lost Decade was to land 100 of the Japanese Self Defense Forces on the disputed Kuril Islands. The effects would be highly reflationary for Japan's economy. I also blogged on April Fool’s Day about A modest proposal to restore America. Ironically, war would likely be bullish for the markets, though it is not a possibility that most of us would like to contemplate. It is nevertheless a path that we have to allow for in our investment planning scenarios. Wait 8 years for a new bull? USA Today recently asked How will Baby Boomers' retirement affect stocks? I may have an answer from academia. Further to my post about anxious and volatile markets, John Geanakoplos, co-author of the paper entitled Leverage cycles and the anxious economy, also wrote another intriguing paper called Demography and the Long-Run Predictability of the Stock Market, with Michael Magill of the University of Southern California and Martine Quinzii of the University of California at Davis. Recall that the previous anxious markets paper that I cited indicated that current macroeconomic conditions called for volatile markets in the aftermath of the economic crisis. This latest paper suggests that we are gripped by a secular bear market until 2018. Putting it all together, the current environment is reminiscent of the 1970s, which was gripped by inflationary fears, slow growth, volatile markets and flattish equity returns. The chart below of the Dow Jones Industrials Average shows that, since the Second World War, the market has been gripped by two episodes of secular bull markets to be followed by secular bears. The secular bulls were characterized by a substantial advance lasting over a decade while secular bears were marked by sideways markets lasting over a decade. These studies are also consistent with the big bear charts at dshort.com, where Short shows the progress of the stock markets following the Great Depression and Japan’s Lost Decades. The market action last week was dominated by concerns of a double-dip. Indeed, the week began with John Hussman warning of a double-dip recession and ended with John Mauldin's hand wringing over the NFP release. Dr. Copper, one of the most economically sensitive of commodities, is curiously showing weakness but hasn’t fallen apart. This is an indication to me that it may be a little early to over-react to recessionary fears. By contrast, the SPX has shown a greater degree of weakness than copper. While the red metal is in a downtrend, it hasn’t even tested major support levels. By comparison, equities sliced through support like a hot knife through butter. In fact, the entire commodity complex is showing the same pattern as copper – weakness but no freefall. Does that mean all is well? Not quite. Take a look at the copper to SPX ratio. While the ratio is indicating a near-term positive relative performance by copper, the ratio is displaying a rounding inverted saucer top pattern which is indicative of a long term decline. These conditions are consistent with the readings of my Inflation-Deflation Timer model, which remains in neutral but perched at the edge of a deflation reading, which would be indicative of a 2008-style panic. The Inflation-Deflation Timer model is a trend following model, which can be late in calling economic trends. These conditions are also consistent with John Hussman’s earlier essay outlining the tripwires of a double-dip recession. The only sign that remained to call for a full blown double-dip recession was the ISM Index at or below 54. The latest release of the index came in at 56.2, declining fast but not quite at 54 yet. Hussman did note, however, that the ECRI Weekly Leading Indicator, which has been in freefall, is highly correlated with ISM with a lead time of 13 weeks - and that's why he made the double-dip recession call. Overall, I am tilting towards the views of Barry Ritholz, who wrote that "We do not rule out a double dip or a recession in 2012 — we simply do not have sufficient evidence to draw that conclusion." Right now, my inner investor is extremely cautious and defensive in light of the risks of a hard landing. On the other hand, my inner trader tells me that a waterfall decline is not an immediate threat, but to be prepared for a short and sharp relief rally to lighten long positions and/or to initiate short positions. The headline on Marketwatch blared that the BP spill may lead to higher oil prices. Indeed, Jeff Rubin has expressed similar sentiments about how the Deepwater Horizon disaster is likely to affect the supply situation for oil (see examples here and here). I agree wholeheartedly. My latest monthly comment for Qwest Investment Management details these same supply concerns. I would also add the possibility of higher heating demand from a global cooling cycle. There is a controversial view that solar cycles are responsible for the warming and cooling cycles on earth. The English astronomer William Herschel noted a relationship between sunspot cycles and wheat prices and that link has been confirmed by other researchers. Right now, the sun is undergoing an extraordinarily quiet period and tracking previous periods of global cooling. If the climate were to cool, which would raise heating demand, and oil supplies fall because of higher operating and environmental standards – look out! Come and read it all here. There has been a lot of discussion over financial regulation lately. My view has always been that trying to regulate financial entities is like herding cats. Just when you think you’ve got them rounded up, one or two get away and trouble starts all over again. It was kind of crazy what people were being paid. And for the more senior people, the kind of deals they were getting—because their pay tends to be not just a number range but a percentage of the profits they generate—they were getting very high percentages of the profits, and very high guaranteed income. The decision to pay those kinds of numbers was motivated by the fact that other places were paying those kinds of numbers, and their ability to pay those kinds of numbers was motivated by the fact that there were huge amounts of assets coming into hedge funds, and hedge funds are able to charge a management fee for the assets under management. So if you had tons of assets coming in, you needed people to manage those assets, you had to get quality people, you had a ton of money to spend, and everybody was looking for people who had a resume that singled them out, or that identified them as qualified to work at a hedge fund—there was just tremendous competition for those people, and it drove prices to ridiculous levels. It changed people’s attitudes—there was a palpable cockiness that one sensed from employees. And there was a lack of distinction I think between people who were really good, who you would want in any environment, and people who you could just fill a seat with because they had a resume that stamped them as minimally qualified. There are a lot of very creative people working on Wall Street and they will engage in regulatory arbitrage. If you try to regulate one activity, e.g. how hot IPOs are distributed, that particular problem will go away but that creative talent will go elsewhere to do something else that creates the next regulatory problem. The disclosure part is easy to understand. Complete and timely disclosure doesn’t allow one side to stack the deck. The second part is a little bit more subtle. The current structure at investment banks aren’t incentivizing people to get rich slowly by building long-term relationships, but to get rich quickly by doing the trade while ignoring the long-tailed risks that may come with the trade. That’s an asymmetric incentive structure. One very simple solution is to bring back the partnership investment bank. Barry Ritholz and I are on the same page on this issue and he correctly points out that none of the Wall Street partnerships got into trouble in the last financial crisis. While I am disinclined to regulate, it doesn’t mean that government is inherently bad. In fact, good government can be a positive force in creating the structure for economic growth. But then you realize that it’s not like they can’t figure this out. It’s not like they don’t get the fact that it’s pretty annoying that the power goes out six times a day and it’s pretty annoying to have six fuel generators humming all the time. The reason investment doesn’t happen is because it’s in some powerful person’s interest that it not happen. There’s some guy who controls the diesel trucks who makes tons of money from being a diesel distributor, and there’s a guy with all these generators who would be out of business if power plants were built, and he stands in the way. Western observers attempting to come to grips with Afghanistan's fragmented state authority also find themselves drawn to other aspects of the medieval era, a period in which leadership in Europe was personal rather than bureaucratic and the state's power to impose its will quite limited. The difficulty for a monarch was that the resources remained in the hands of his vassals, who then acted in their own interests. The rise of centralized states in Europe in the 16th through 18th centuries finished a process by which monarchs gradually centralized power and dispossessed their feudal nobilities. Then, in the beginning of the 19th century, the rise of the European nation-state took this process a step further and dispossessed the monarchs while keeping intact the centralized administrations they had built. Foreigners encountering Afghanistan in the post-2001 era saw this devolution of power as an example of state failure. Many of the multiple competitors for legitimate authority at the local level had no desire to participate in politics in a state-centered system. Autonomous tribes and ethnic groups, local militia commanders, criminal syndicates, and even blood-feuding families sought to resist state power, but they did not seek to overturn or replace it. This arrangement is analogous to medieval Europe, where kings were frequently also unable to maintain a monopoly on the legitimate use of violence, but were still able to retain their thrones. Is that what we really want? Be careful about what you wish for when you want the government off your back.